This section is dedicated to our actual and future partners who believe that no one could be the master of all the necessary knowledge to rise or improve a business, who understand that a business - consultant partnership is more profitable, faster and even cheaper than waiting. Whenever the business invest in the people skills development, it's a great investment; just the results will be visible, in terms of a business impact, after a medium-long time. The business should wait the employee to practice, to learn from positive and negative experiences, should empower the field force (management and execution) with all the necessary courage and mentality, should invest in tools as well. "BUSINESS" means clients and suppliers, products and services, processes and projects, profit and image! Finding what it really does not work, handling the root cause not the effect, removing the non-value activities and reducing the process and outputs variation it is actually an OPTIMIZATION! 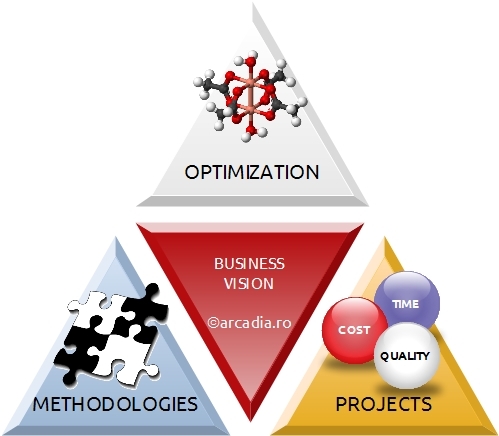 Nowadays, the most impact optimization approach is LEAN SIX SIGMA. Finding Lean Six Sigma as a unique and logical merge between the faster "LEAN Management" which reduce the waste and increase the speed in providing products and services to the client, and the defects and variation tough killer, "SIX SIGMA" is the best you can do for raising your company. Even if Lean Six Sigma is considered to be the most impact and efficient short and long term improvement approach, every business decision maker must understand that the system should be tailored different regarding the business specifics, products, or services outputs. Taking into consideration that most of the training providers choose the way of delivering the Lean Six Sigma Body of Knowledge standard, focused on products delivery, Arcadia Consulting went further the standard and developed a high accredited training program, suitable for services delivery (banking, telecom, energy providers, retail, software development, or IT services). Even if all the evolution must be under control, it is mandatory to let them make "mistakes", to allow bottom-up initiatives and additionally, to push for a "by the book approach". We must admit that this is an incredible era when everything changes in a blink of an eye: market, clients and theirs critical requirements, products and services, systems and processes, technologies and functions. There are moments when there is no time for thinking, so, can a business have time for waiting? Can a business afford this? This is the moment when the business should seek out for a consultant partner; a consultant who already has an "over the top" competency (including a vast "on the field" experience), a fair partner who is dedicated to work for your business vision and goals; a consultant capable to innovate and work hard as well. This is the moment when you are invited to read what we are doing and see how we can help if you need it; the "kick off" for a long term partnership.